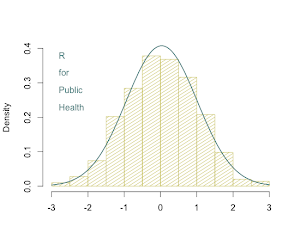 I've been alluding to different R data types, or classes, in various posts, so I want to go over them in more detail. This is part 1 of a 3 part series on data types. In this post, I'll describe and give a general overview of useful data types. In parts 2 and 3, I'll show you in more detailed examples how you can use these data types to your advantage when you're programming. 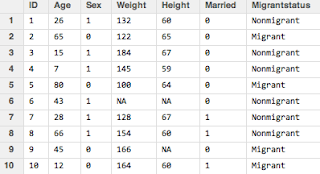 and Stata knows that I am talking about the column Age of this dataset. There are other classes including factors, which are so useful that they will be a separate post in this blog, so for now I'll leave those aside. You can also make your own classes, but that's definitely beyond the scope of this introduction to objects and classes. Ok, so here are some examples of different ways of assigning names to these objects and printing the contents on the screen. I chose to name my variables descriptively of what they are (like numeric.var or matrix.var), but of course you can name them anything you want with any mix of periods and underscores, lowercase and uppercase letters, i.e. id_number, Height.cm, BIRTH.YEAR.MONTH, firstname_lastname_middlename, etc. I would only guard against naming variables by calling them things like mean or median, since those are established functions in R and might lead to some weird things happening. 2. Vector: use the c() operator or a function like seq() or rep() to combine several numbers into one vector. 3. Matrix: use the matrix() function to specify the entries, then the number of rows, and the number of columns in the matrix. Matrices can only be indexed using matrix notation, like [1,2] for row 1, column 2. More about indexing in my previous post on subsetting. 4. Dataframe: use the data.frame() function to combine variables together. Here you must use the cbind() function to "column bind" the variables. Notice how I can mix numeric columns with character columns, which is also not possible in matrices. If I want to refer to a specific column, I use the $ operator, like dataframe.var$ID for the second column. Alternatively, any dataset you pull into R using the read.csv(), read.dta(), or read.xport() functions (see my blog post about this here), will automatically be a dataframe. What's important to note about dataframes is that the variables in your dataframe also have classes. 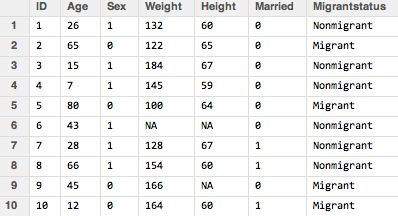 So for example, the class of the whole dataframe is "data.frame", but the class of the ID column is a "factor." Again, I'll go into factors in another post and how to change back and forth between factors and numeric or character classes. 5. List: use the list() function and list all of the objects you want to include. The list combines all the objects together and has a specific indexing convention, the double square bracket like so: []. I will go into lists in another post. So that was a brief introduction to objects and classes. Next week, I'll go into how these are useful for easier and more efficient programming.